Last year I was asked to write an article on Smart City standards for the IEEE standards magazine. This blog post was the basis for that article, but also acts as an evolving document as I update it to reflect standards activities. The amount of activity in Smart City standardization is truly overwhelming – this is partly due to the breadth and scope of Smart City activities – from water pipes to people – and partly because it is early in the process and the standards bodies are still trying to understand how best to contribute. Level 1: Strategic: These are smart city standards that aim to provide guidance to city leadership and other bodies on the “process of developing a clear and effective overall smart city strategy”. They include guidance in identifying priorities, how to develop a roadmap for implementation and how to effectively monitor and evaluate progress along the roadmap. Level 2: Process: Standards in this category are focused on procuring and managing smart city projects – in particular those that cross both organizations and sectors. These essentially offer best practices and associated guidelines. Once we have a usable framework, the process of trying to fit standards into the levels can begin. The BSI folks have made a useful start – highlighting a number of ongoing international activities that they, as the UK’s standards body, collaborate on – and placing them in the framework. CEN/CENELEC/ETSI: In Europe, standards are developed and agreed by the three officially recognized European Standardization Organisations: the European Committee for Standardization (CEN), the European Committee for Electrotechnical Standardization (CENELEC) and the European Telecommunications Standards Institute (ETSI). IEC: Founded in 1906, the IEC (International Electrotechnical Commission) is the world’s leading organization for the preparation and publication of International Standards for all electrical, electronic and related technologies. These are known collectively as “electrotechnology”. It’s still a fairly daunting set of activities, but at least we now have a sense of where the major international standards groups are focused and we can begin to take a look at some of the more important activities. In the next section, I highlight a few activities that I’ve come across that I think are important and seem to have significant momentum. If you are looking for a more comprehensive list, then in the final section, I’ve listed up all the activities I’ve come across. Note, most actual standards documents are expensive – unless you are a member of the standards body – so a casual browse isn’t an option. I’ve linked to official documents and summaries below and if I’ve come across a publicly accessible overview, I’ve added that – if you know of better public information, let me know. ISO 37120 Sustainable development of communities — Indicators for city services and quality of life. This standard, part of a suite by ISO’s Technical Committee 268 identifies 100 indicators that cities should track to allow them to benchmark progress. Actually there are 17 areas, 46 core and 54 supporting indicators that cities either “shall” (core) or “should” (supporting) track and report. The World Council on City Data (WCCD) has been set up by cities to benchmark cities and has certified 17 global cities. Worth taking a look. The development of a Data concept model for smart cities (PAS 182). This is probably worth a look at if you are interested in data hubs and data interoperability issues as it bases some of its work on the UK’s HyperCat IoT interoperability standard. ISO: Report from JTC1 – looking at ICT for smart cities: A 2014 document that lays out the Smart City space from a technical point of view. There’s a useful diagram (fig 4) that highlights the technical areas that ISO, IEC and ITU are working on as well as details of their standards work and of the overall activities of JTC1 – great info but heavy going. IEEE P2413 (http://standards.ieee.org/develop/project/2413.html) is a developing standard from the Institute of Electrical and Electronic Engineers (IEEE) for an architectural framework for the Internet of Things (IoT). The standard is being designed, when completed, to offer a reference model defining relationships among various IoT verticals such as transportation and healthcare (the same verticals that are being transformed in the world’s transition to smart cities) and their common architecture elements. 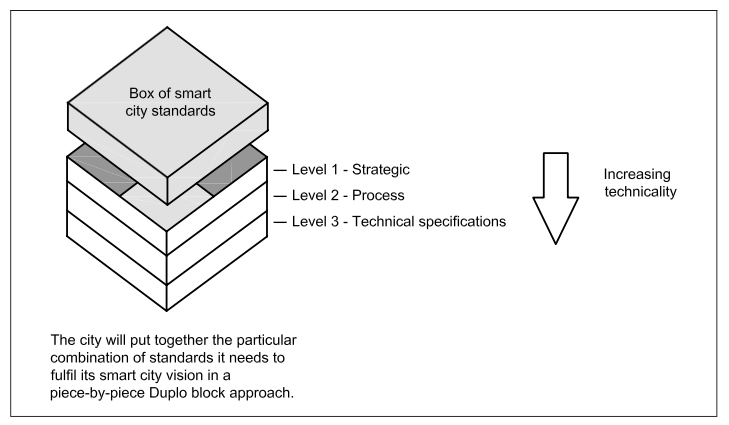 It’s also worth taking a look at the full set of BSI standards for Smart Cities. Although these are national standards, the UK seems to have developed a comprehensive set of Smart City activities quite early and they appear to be feeding in to ongoing international organizations. A somewhat more nascent effort by the US National Institute of Standards (NIST) can be found here – this seems to be more of a ‘call to action’ than actual NIST endorsed standards, but worth taking a look at if you are USA based. ISO/TS 37151: Smart community infrastructure metrics – General principles & requirements 7. General – IEEE has a document that lists up their standards that they think are related to Smart Cities – available here. The National Institute of Standards and Technology (NIST) released a preliminary discussion draft of its Framework for Cyber-Physical Systems. The draft has an ambitious goal: to create an integrated framework of standards that will form the blueprint for the creation of a massive interoperable network of cyber-physical systems (CPS), also known as the “Internet of Things.” In 2014, NIST established the cyber-physical systems public working group(CPS PWG)—an open public forum. You may be interested in my article on Technology Trends affecting Smart Cities which includes a discussion of Smart City Standards.